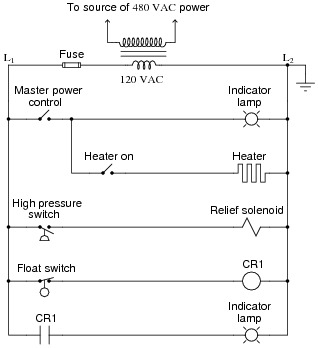 How do we know which relay contact is actuated by which relay coil? 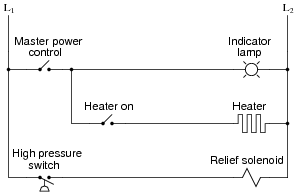 How does this convention differ from that of standard electrical/electronic schematic diagrams, where the relay coil is shown as an actual coil of wire (inductor symbol) with the contact "linked" to the coil by a dashed line? Also, what type of logic function behavior (AND, OR, NAND, or NOR) does the above circuit exhibit? In ladder logic diagrams, relay coils are associated with their respective contacts by name rather than by proximity. In this particular circuit, the logic function represented is the AND function. Many students find it confusing that relay contacts and coils need not be drawn next to one another in a ladder logic diagram, because it is so different from the schematic diagrams they are accustomed to. The non-necessity of proximity in a ladder logic diagram does have its advantages, though! It is simply a matter of getting used to a new way of drawing things. There is a problem somewhere in this relay logic circuit. Lamp 2 operates exactly as it should, but lamp 1 never turns on. Identify all possible failures in the circuit that could cause this problem, and then explain how you would troubleshoot the problem as efficiently as possible (taking the least amount of electrical measurements to identify the specific problem). This is a problem worthy of a good in-class discussion with your peers! Of course, several things could be wrong in this circuit to cause lamp 1 to never energize. When you explain what measurements you would take in isolating the problem, be sure to describe whether or not you are actuating either of the pushbutton switches when you take those measurements. Be sure to leave plenty of classroom time for a discussion on troubleshooting this circuit. Electrical troubleshooting is a difficult-to-develop skill, and it takes lots of time for some people to acquire. Being one of the most valuable skills a technical person can possess, it is well worth the time invested! The challenge question is very practical. Too many times I have seen students take meter measurements when their other senses provide enough data to render that step unnecessary. While there is nothing wrong with using your meter to confirm a suspicion, the best troubleshooters use all their senses (safely, of course) in the isolation of system faults. The wiring sequence shown here is not the only valid solution to this problem! This circuit provides students with an opportunity to analyze a simple latch: a system that "remembers" prior switch actuations by holding a ßtate" (either set or reset; latched or unlatched). A simple motor start/stop circuit such as this is about as simple as latch circuits get. Students should be able to immediately comprehend the benefit of using nice, neat, structured ladder diagrams when they see the tangled mess of wires in a real motor control circuit. And this is not even a complex motor control circuit! It takes very little imagination to think of something even uglier than this, and what a task it would be to troubleshoot such a circuit without the benefit of a ladder diagram for guidance. Pushbutton switch A fails open: Lamp 1 always energized, lamp 2 simply becomes inverse status of pushbutton switch B.
Relay coil CR2 fails open: Both lamp 1 and lamp 2 simply become inverse status of pushbutton switch A.
Relay contact CR1-1 fails open: Lamp 1 simply becomes same status as pushbutton switch B.
Relay contact CR2-1 fails shorted: Lamp 1 always energized. Relay contact CR2-2 fails shorted: Lamp 2 simply becomes inverse status of pushbutton switch A. Though many electronics students and professionals alike associate semiconductor components with the word "digital," electromechanical relays are also digital logic (on or off) devices. In fact, some of the first digital computers were built with electromechanical relays as their active elements. In what ways are electromechanical relays similar to semiconductor logic gates? In what ways do the two digital technologies differ? Like semiconductor gates, electromechanical relays have but two states: energized and de-energized (1 and 0). 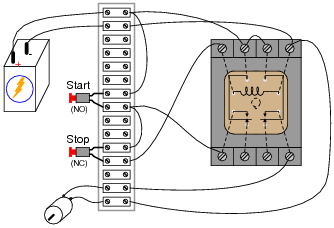 Like gates, the contacts of relays may be interconnected to perform standard logic functions such as AND, OR, NAND, NOR, and NOT. This question provides a good opportunity to review electromechanical relays: how they work, what they are used for, etc. 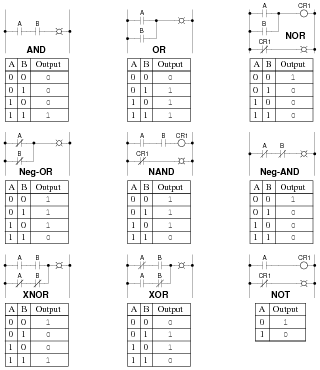 Write a truth table for this circuit's function, and determine what name best represents it (AND, OR, NAND, NOR, or NOT). This is an AND function. Ask your students to identify what arrangement the relay contacts are connected it: series or parallel? Does this contact arrangement make sense with regard to the established function of the gate? This is an OR function. Each parallel circuit branch is represented as its own horizontal "rung" between the two vertical "rails" of the ladder. As you may have noticed, some of the symbols resemble standard electrical/electronic schematic symbols (toggle switches, for instance), while others are unique to ladder logic diagrams (heater elements, solenoid coils, lamps). Where do the circuits shown obtain their electrical power? What do "L1" and "L2" represent? How are relay coils and contacts represented in a ladder logic diagram? Answer each of these questions by expanding upon the diagram shown above: draw the components necessary to show a complete electrical circuit (i.e. details of the power source), as well as an additional rung (or two) showing a relay coil actuated by some sort of switch contact, and the relay contact controlling power to a second indicator lamp. "L1" and "L2" represent the "hot" and "neutral" lines, respectively, in a 120 volt AC power system. Often, the control circuit power is obtained from a step-down transformer, which is in turn fed by a higher voltage source (usually one phase of a 480 volt AC three-phase system, in American industrial applications). If students don't raise this point on their own, direct their attention to the relay coil and contact symbols. What looks strange here? 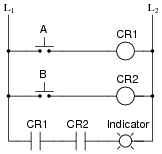 What sort of electrical component are students familiar associating with the "CR1" contact symbol? Does it make sense to use this symbol to symbolize a normally-open switch (relay) contact? If we wished to show a normally-closed relay contact instead, how would we modify the diagram? 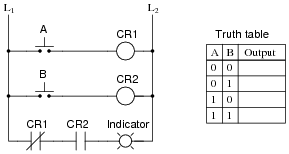 Complete the following ladder logic diagram so that an OR gate function is formed: the indicator lamp energizes if either switch A or switch B is actuated. Discuss with students the fact that relay coils and contacts need not be located near each other in ladder diagrams. While this may be confusing at times, it is a very flexible feature of ladder logic notation, because it gives the author the freedom to locate relay contacts where it makes the most visual sense in the öutput" rung of the diagram, without having to coordinate locations of coil and contact as is generally necessary in traditional schematic diagrams. Instead, relay contacts are associated with their respective coils by label, not by proximity on the diagram. 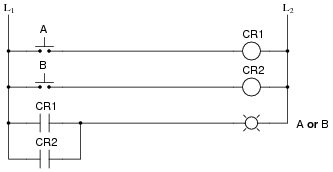 In ladder logic diagrams, a normally-open relay contact is drawn as a set of parallel lines, almost like a non-polarized capacitor in an electronic schematic diagram. 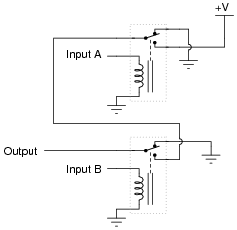 Normally-closed relay contacts differ in symbolism by having a diagonal line drawn through them. 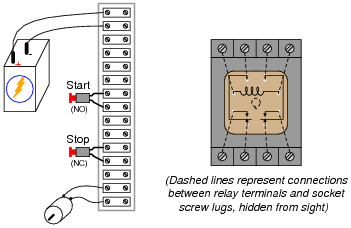 Many students find the "line-through-the-contact" a very intuitive way to represent normally-closed relay contacts. Be sure to emphasize that the diagonal line, as well as the name normally-closed, does not refer to any given state of the contact, but rather to the contact's resting state when the relay coil is de-energized. I have seen teachers put a diagonal line through a relay contact symbol on a ladder logic diagram to indicate the state of the contact being closed by energization of the coil, during the process of explaining how a circuit functioned. This is wrong, as it confuses the concept of contacts being normally-closed with the concept of contacts simply being (energized) closed. This is a mistake I've seen many students make. 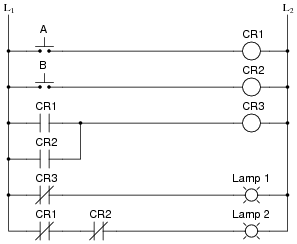 Explain what the mistake is, and draw a corrected version of this relay circuit. Never, ever connect load devices in series in a control circuit such as this! Discuss with your students why load devices are never to be connected in series. What would be the effect of doing so? Have them answer this question in terms of normal operation, and also in terms of operation given a failure condition in one of the series-connected load devices. 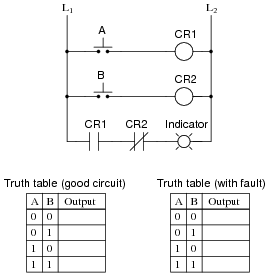 Explain why the truth table will be modified as a result of the fault. If you thought that the "faulted" truth table would be all 0's, you probably thought I said relay contact CR2 failed open. The fault I proposed was relay CR2 coil failed open. "Stop" pushbutton switch fails open: Motor cannot start, lamp never energizes. Relay contact CR1-1 fails open: Motor starts and lamp energizes when "Start" button is pressed, but both immediately de-energize when it is released. Relay contact CR1-2 fails open: "Motor run" lamp turns on and off as expected, but the motor itself never runs. Relay coil CR1 fails open: Motor cannot start, lamp never energizes. Suppose you come across a relay that is said to have "Form C" contacts. What does this phrase mean? And, is there such a thing as either "Form A" or "Form B" contacts? "Form C" is just another way of saying "SPDT" with regard to switch or relay contacts. When I first heard of a switch having "Form C" contacts, I had absolutely no idea what it meant. I was quite familiar with ßingle-pole, double-throw," but not this new term. Different industries often use different terms for describing the same things. Your students should be made aware that there is a tendency for people to become ïsolated" within their respective industries or fields of expertise, to the point where they may be unaware of alternative terms for the same things (Form-C versus SPST is a good example of this). Your students may even find themselves misjudged by others for not knowing the peculiar and specialized terms used within certain industries, when they first obtain employment. In many ways it is akin to the misunderstandings arising when different cultures meet: people have the general tendency to think their way of doing things is the only way. Bridging such cultural divides requires patience, humility, and tact. Safety is a paramount concern in electrical systems. Generally, we try to design electrical circuits so that if and when they fail, they will do so in the manner safest to those people working around them, and to the equipment and process(es) controlled by the circuit. One of the more common failure modes of circuits having wires strung through metal conduit is the accidental ground, or ground fault, where the electrical insulation surrounding a wire fails, resulting in contact between that wire and a grounded metal surface. What would be the result of this fault? Hint: you will need to know something about the L1/L2 power source in order to answer this question! What would be the result if the L1/L2 power connections were reversed? In a properly designed system, with L2 grounded at the power source, this fault will result in a blown fuse when the pressure switch closes. 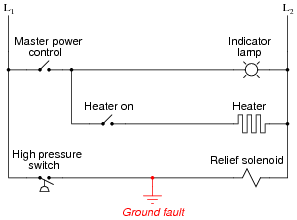 In a circuit with L1 and L2 reversed, this same ground fault would energize the relief solenoid, with or without the pressure switch's "permission." The ultimate purpose of this question is not to ascertain the effects of a particular fault so much as it is to derive a general rule regarding the construction of industrial control circuits. Students should be able to see the benefits of having L2 (the grounded power rail) on the right-hand side of the circuit, but can they induce the general safety principle to be applied in all control circuits? What is ßpecial" about having L2 on the right-hand side of the ladder diagram? Complete the following ladder logic diagram so that an AND gate function is formed: the indicator lamp energizes if and only if both switch A and switch B are simultaneously actuated. 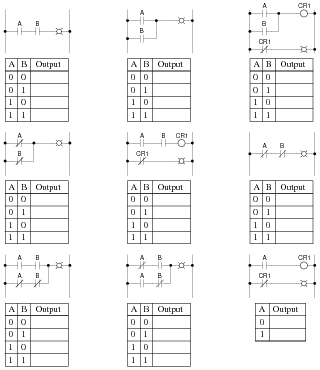 Write a truth table for each of the indicator lamps in the following ladder diagram, and determine which logic function (AND, OR, NAND, NOR, or NOT) best describes each lamp's behavior with respect to the status of the input switches. Each of the lamps exhibits the behavior of a "NOR" gate. This question provides a good opportunity for students to practice analyzing relay logic circuits, and it also foreshadows DeMorgan's Theorem in its dual implementation of the NOR function. Note to your students how more than one contact is being used on control relays CR1 and CR2!